Net Weight: Packet (400 seeds)1oz (8000 seeds)(+$6)1/4lb (32000 seeds)(+$15)1/2lb (64000 seeds) (+$24)1lb (128000 seeds) (+$30) This item is currently out of stock! The so called Stem Turnip because the turnip like tuber is an enlargement of the stem 1 to 3 inches above the ground. 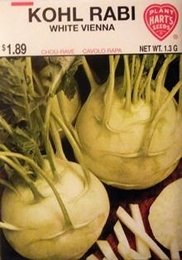 The light green tuberous stem is used the same as turnips, and should be used when 2 to 3 inches in diameter. Flesh is clear white, tender and crisp, not unlike that of cauliflower. This plant prefers a sunny, well drained location. Water as needed by soaking ground around plants. Bulk Kohl Rabi seed available. 8000 Seeds/oz. Plant 1/4oz per 100ft row. 4lbs of Kohl Rabi seed needed per acre.